You’ve been brushing your teeth with toothpaste since you were a child, but you’ve never really understood exactly how it functions. All you know is that it’s a major part of a ritual that you’re supposed to participate in every morning and night. But you’d like to change that and become more educated about what toothpaste does and what makes it effective. Thankfully, your dentist in Ripon has the information you need. Fluoride – Fluoride is the main ingredient in toothpaste that provides its protective properties. It’s a mineral that strengthens the enamel on your teeth, making it less susceptible to cavities and decay. Abrasives – Abrasives aid in the effectiveness of toothpaste by providing a gentle degree of roughness that agitates the debris on your teeth, making them easier to be removed. Flavors – Flavors are added to make the paste more tolerable and encourage you to participate in oral hygiene, by providing a more desirable experience. Detergents – Detergents are added to help in cleaning your teeth and provide the white finish that you see after an application. What is a Specialty Toothpaste? A specialty toothpaste is one that has a higher concentration of certain ingredients. Your dentist may prescribe it to address teeth that are sensitive, prone to cavities and tooth decay (despite your efforts to brush and floss as recommended), or that have weak tooth enamel. A common misconception is that the more toothpaste you use, the better. In reality, though, an adult only needs to use a pea-size of toothpaste to properly clean his or her teeth. For children five and older, only use half of the amount that is recommended for adults, and toddlers four and under, should only be using a small streak. An important point to remember about your oral hygiene is that consistency reigns supreme. 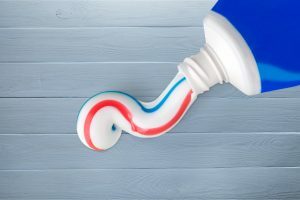 So now that you know more about toothpaste, be sure to consistently brush and floss your teeth at least twice a day, with the understanding that you are actively working to ensure your oral health for years to come. Finally, make it a priority to consistently visit your family dentist of Ripon semi-annually for cleanings and checkups, to fortify your excellent oral hygiene. Dr. Christopher G. Johnson received his undergraduate degree from Ripon College and then went on to earn his Doctor of Dental Surgery degree from the Marquette University School of Dentistry. He is also a graduate of the Dawson Academy and has trained with the world’s premier instructors of various modalities. He practices at Silver Creek Dentistry and can be reached for more information through his website.